Kate and I bought Gulliver G, a Nicholson 32, in summer 2006, when I was 28 and Kate was 27. The purchase was entirely unintentional. 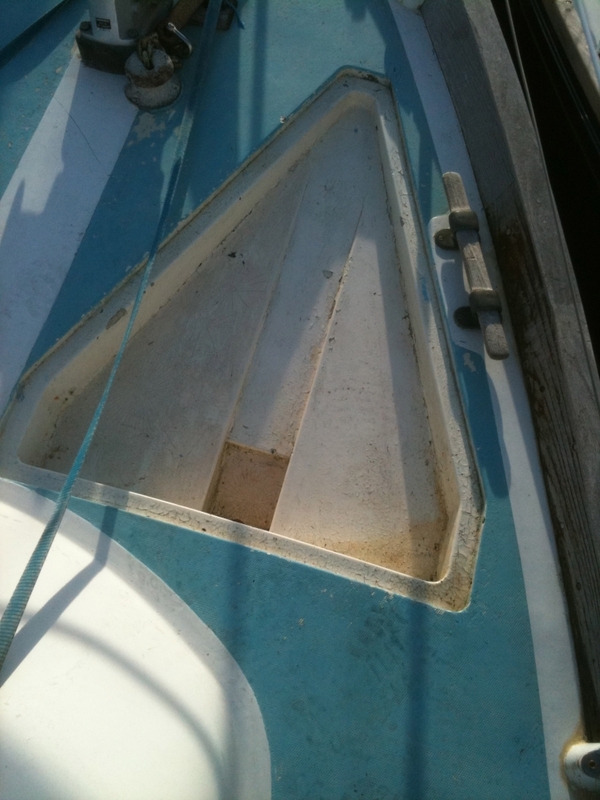 At that time I had only recently got back into sailing after a break of ten years or so due to university and a new career and Kate’s only experience of sailing was with me in a 22-foot drop-keel Seal Sinbad which we had purchased just 4 months previously. The plan had been to be very sensible and sail the Seal for a couple of years before progressing to a larger vessel. That plan got scrapped as soon as we saw Gulliver G on the hard on Hayling Island. I know a proper boat when I see one and Gulliver G immediately re-ignited long suppressed ambitions to go off deep water cruising. It was love at first sight. When we bought Gulliver G, I was starting a training contract as a solicitor and Kate was enjoying her career as a pharmacist. Dreams aside, we had no immediate intentions to sail long distances and in those early days simply getting in and out of our marina berth without damaging anything felt like a massive achievement (OK, it still does!). Crossing the Channel seemed worthy of a medal. The purpose of this article is chiefly to describe the preparations which went into getting our boat – and ourselves – up to spec for our Atlantic circuit prior to leaving the UK. Although everyone’s circumstances differ, taking a big chunk of time out of work/everyday life is as much a part of the planning and preparation as doing the antifouling, so I have touched on how we went about it – though the primary focus is on what we did to prepare Gulliver G.
By ‘Atlantic Circuit’, I mean sailing west from the Solent, down through the Chenal du Four, across the Bay of Biscay to NW Spain and from there down to Madeira, the Canaries and Cape Verdes before crossing to Barbados. A few months’ cruising the Caribbean, and then back to the UK via Bermuda and the Azores. A total distance of around 10,000 nautical miles. Initial plans for the voyage started to take shape around Easter 2010 when, after 10 years together Kate and I got married. There were many matters to be taken into consideration: funding, careers, what to do with the house, the cat (the vicious beast was duly offloaded onto Kate's unsuspecting parents), preparing the boat and ourselves. Shortly after our return from honeymoon, in May 2010, I bought Les Weatherwitt’s Sailing Your First Atlantic Circuit. This was soon joined by Jimmy Cornell’s World Cruising Routes. It was evident that the best time of year to cross Biscay would be summer, but that the Atlantic crossing should be undertaken mid-November or later. We decided that a year should be ample preparation time, and that the aim should be to have the boat ready to cross Biscay in June 2011, with the onward journey commencing October 2011. A key advantage to this timing was that we were both on 3 months’ notice at work and did not want to resign until we had got across Biscay, since that would be our first passage spanning several days and nights, non-stop, and, despite our commitment to the voyage, there was the possibility that once we’d reached Spain we might decide that there was no way we would cast our comfortable land-based lifestyles aside for a year at sea. As it happens, both the Biscay crossing and the down-Channel passage which preceded it were rough and wet, but that did not dampen our spirits. Having crossed Biscay, we both handed in our notices of resignation, timed to ensure mutual end dates of 30th September 2011. The decision to put careers on hold was not easy and I worried for a while about the effect of a break like this on career progression. But, we are in our early thirties and decided that if we did not crack on with the voyage now, it may become something that we would never do. No-one I spoke to seemed to think that taking 9 months or so out to fulfil a lifetime’s ambition would be viewed as anything other than a positive by potential employers on our return. After all, it demonstrates a willingness to take calculated risk (giving up secure employment), an ability to set and adhere to goals as well as planning and project management skills. For all those true ‘free spirits’ out there this may sound very droll and corporate, but any other ambitious professional contemplating a break of a year or so to do something entirely different will no doubt understand these considerations. Back to Spring 2010: it was evident that we had a lot to do preparing both the boat and ourselves for the voyage and that the deadline for these preparations had to be the beginning of June 2011. The Nicholson 32 Association Cherbourg Rally was to take place on 4th June 2011. We decided that we would like to attend the Rally (not least as we were organising it) and continue from there. Clare Francis sailed Gulliver G across the Atlantic, and herself into the history books as the first woman to sail across single-handed, in 1973. 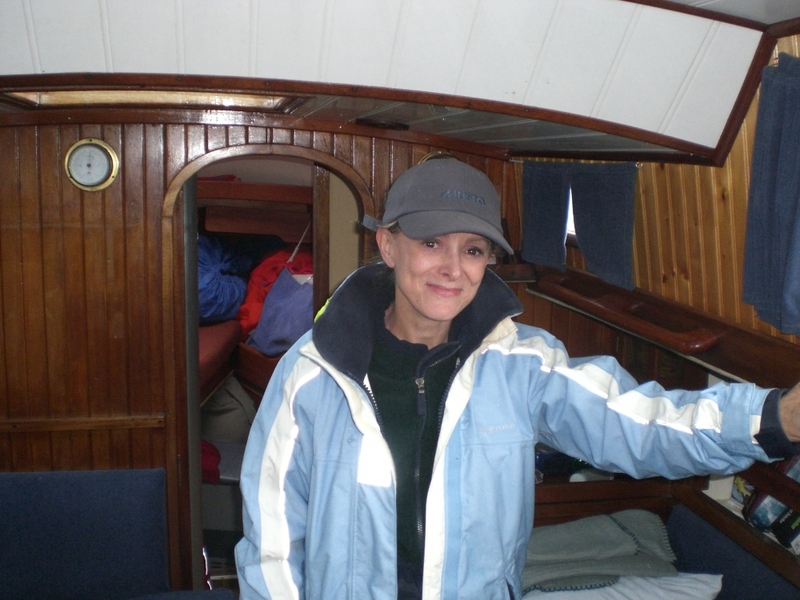 Having discussed with Clare Francis some of her experiences in Gulliver G, we know that she sailed the boat hard, unperturbed by gales and storms and never eager to reduce canvas! As well as having been across the Atlantic at least twice already, Gulliver G has been in the Round Britain Race two times that we know of and down to the Med. Many other Nicholson 32s have been cruised throughout the Atlantic and Pacific oceans and a number have completed circumnavigations. By pure coincidence, in Porto Santo we berthed alongside Orkestern, a Swedish owned Nicholson 32 Mark X (Gulliver G is a Mark IV) whose previous owner completed one and a half circumnavigations in her and whose current owners, Filippa and Martin, plan to sail to Australia. With their deep long keels and classic lines (only 24’ at the waterline! ), these boats may lack the living space of modern 32-footers, but they more than make up for it in sea-keeping ability and sheer strength. In the highly unlikely event of an inversion, a Nicholson 32 will self-right from 165 degrees. Beyond that point she would only require the slightest nudge to come back up again. This is unlike many modern designs, which will float better upside-down than the right way up. Not that the self-righting abilities of a Nicholson 32 from capsize have ever been properly tested as none of the 400 or so boats built over the last 50 years is ever known to have capsized. A number have suffered knock-downs in severe conditions, but have always come back up quickly, thanks to the narrow shape of the craft, low freeboard and, high (compared to the freeboard) coach roof and the 3.5 tons of lead in the keel. Clare Francis aboard Gulliver G, August 2009. Despite being 45 years old (built 1966) we have never had any doubts at all that Gulliver G is exactly the right boat for this – indeed, any – voyage. All preparatory work involved improvements to what was already an incredibly sound and seaworthy boat. 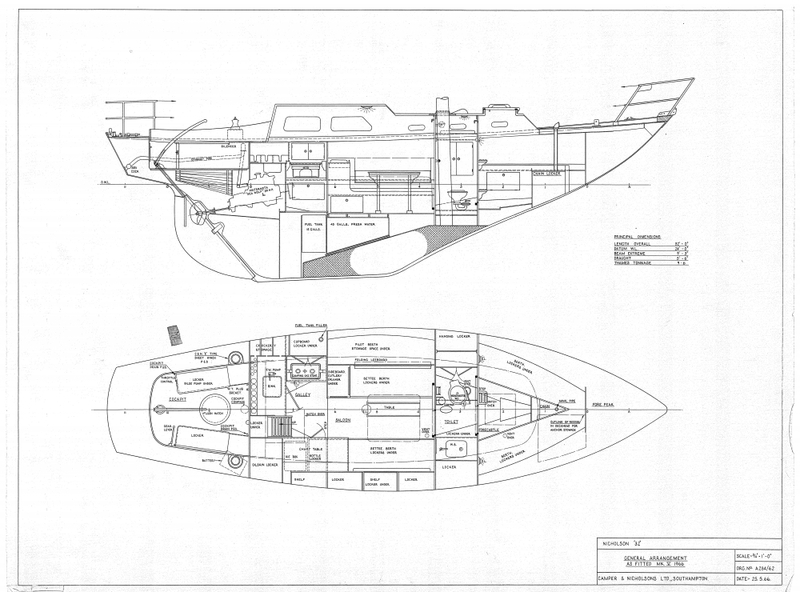 (c) Camper & Nicholson; scanned by the Nicholson 32 Association. The first thing we did, in September 2011, was to buy a beaten up old Citroen estate for a few hundred quid, Kate’s transport being a BMW Z3 and mine being my season ticket for my daily commute to London; equally useless for boat prepping. We live in Princes Risborough, about 100 miles from Gosport where Gulliver G was hauled out for the preparations, and with the amount and size of tools, materials and equipment (such as boat cushions, new ply boards for the headlining, new tender and self-steering) to be carted back and forth we could not have managed without. The Citroen proved a good workhorse, though it did accumulate various mechanical and electrical problems as work on the boat progressed. On the Easter bank holiday 2011 we filled the car to the absolute brim with variae for the final stages of the refit only to find that the ignition wouldn’t work. Fortunately the break-down man who came to our assistance had been thieving motors at the tender age of 15. He showed us how to disassemble the ignition switch and start the car with a pair of pliers. Apparently one shouldn’t hotwire a car as there remains the risk that the steering lock could come on at any time. As the door locks generally didn’t work the car could have been stolen at any time, but I didn’t think that any self-respecting joy-rider would stoop so low. And they didn’t. As if knowing that it’s purpose in life had been fulfilled, the Citroen, which by that point was permanently leaking oil, groaning from a knackered shock absorber and issuing strange whirring and grirring sounds, died a complete and absolute death the week after we had sailed Gulliver G down to Spain. So ended our brief encounter with that emblem of the sensible classes, the estate. latex gloves, dust masks and disposable coveralls (essential for grinding out old GRP). loads of bin bags, paper towel and cloths. The first job, starting in December 2010, was to remove an anchor well in the bow which was designed to hold a Danforth anchor. A Danforth is not much use for a vessel of Gulliver G’s weight; the only time we deployed it the shank bent by 45 degrees on the turn of the tide. Removing the well involved stripping all of the lining out of the forepeak and using an angle grinder to grind out the well, which protruded some way into the forepeak. 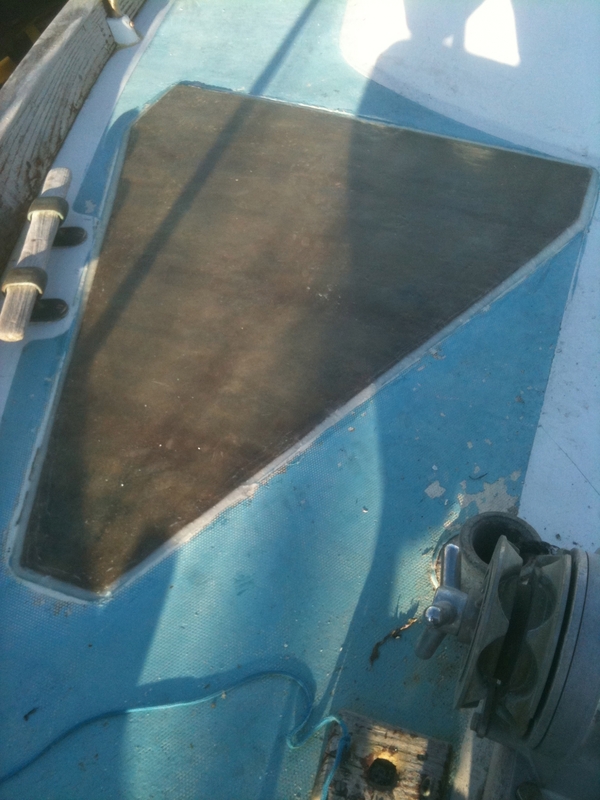 I completed the job of removing the old anchor well and sealing off the resultant hole with 18mm marine ply, which I coated with fibreglass mat and epoxy, followed by more epoxy, over three bitterly cold weekends. The temperature was dropping to below freezing at night and, sleeping in the saloon on bare planks (having removed all of the cushions), I had to wear ski socks and a woollen hat in my sleeping bag. Grinding out the fibreglass well produced huge amounts of fine, irritating dust, but the wet and dry vac soon had it all sucked up. Epoxying the infill into the deck. Infilling the old anchor well – view from below. The pipe was the ineffectual drain for the anchor well; out it came and the skin fitting was blanked off. The reason for starting with the anchor well was simply that I knew it would be the biggest and messiest single job and I wanted to get it over and done with. Although the remaining jobs were smaller, there were a lot of them and we had to work flat-out for virtually every weekend from January to the end of May to get them done. The aim was to ensure that Gulliver G was completely clean and comfortable throughout, with no excess junk. As soon as the anchor well was done we set about clearing the boat out entirely. It is amazing how much stuff can accumulate on a 32 footer. With Gulliver G completely empty (and both our house and the boatyard bins rather full), we set about sanding and re-painting all of the lockers, both below decks and in the cockpit. More dusty work. All of the cushion covers and the curtains went to the dry cleaners and the foam cushions themselves allowed to air in our study, which by this stage was impenetrable. 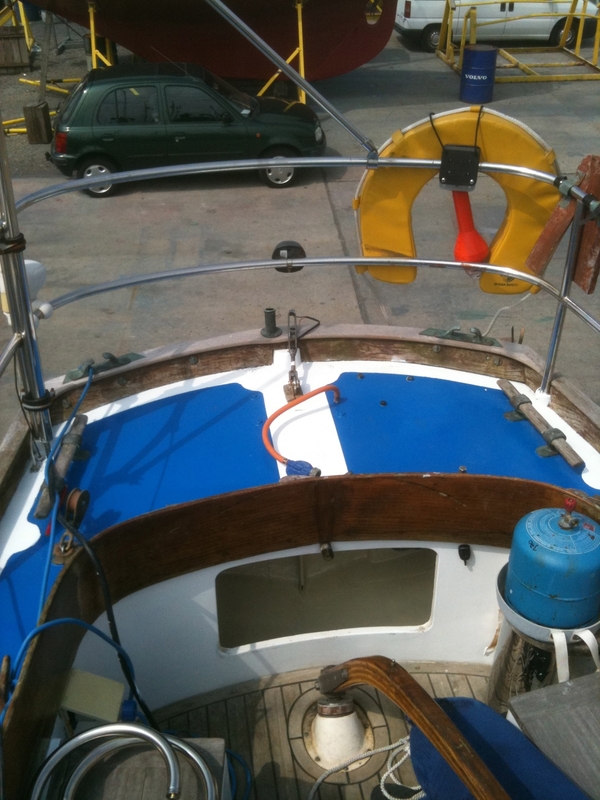 We disposed of the old lee cloths and had new ones made up by CJ Marine, who also cleaned, re-stitched and re-glazed our spray-hood which had started turning green but came back looking like new. Kate lined all of the lockers with cork, intended to stop tins banging around and to absorb moisture. We had decided that we would like to use the forepeak as our bedroom when in port or at anchor, keeping the saloon free as a living area. Previously we had always converted one of the settees in the saloon into a double berth when in port and used the forepeak as a dumping ground. 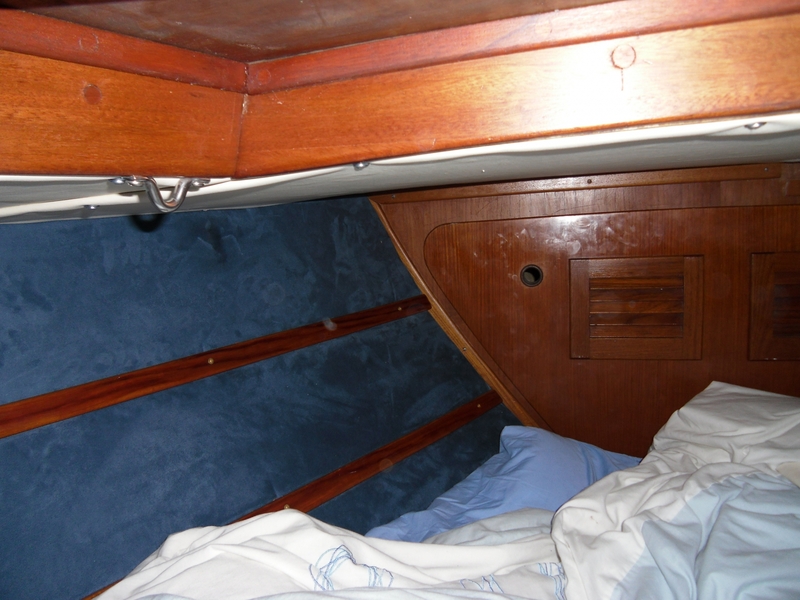 We filled in the gap between the V-berths with a ‘V’ of 12mm ply and an additional foam cushion, so that the whole forepeak became one large berth (on passage we hot-berth in the saloon, using the leeward berth and a lee cloth). The sides and ceiling of the forepeak were lined with thin ply covered with vinyl, which was becoming rather tired and mildewey. Using the old wood as a template I cut new 3mm ply. For the sides of the forepeak we covered the ply with a thin foam and on top of that a soft and cosy velvet-type material. We relined the ceilings with fresh vinyl. I also sanded and repainted all of the lockers in the forepeak. Forepeak ready for relining. Through the bulkhead is the anchor chain locker. The stringers were added by a previous owner to strengthen the hull after some flexing was observed in a Round Britain race way back in the eighties. Relined forepeak. The steel ring in the top left of the picture was an anchor point for a lee-cloth, now redundant as the whole forepeak is one massive berth (well, as massive as anything can be on a Nic 32!). Moving aft to the heads, I had what at first seemed something of a dilemma: our boat was fitted with a Baby Blake. New, these cost around £4,000. Some people, those without Baby Blakes, I suspect, sing the praises of these bits of antiquity. We always found the thing virtually impossible to operate because it would get seriously stiff, however much vegetable oil went down it, and when we did get the flush pump to move it would spray seawater all over the heads compartment, making the paint peel and everything turn green. When we bought Gulliver G, in summer 2006, I spent a Friday afternoon going over the boat with the vendor, Portway Yachts, and their local shipwright. We were agreeing jobs to be done by Portway. Put a man in a boiler-suit and he immediately has my full reverential respect. For this reason I have been known to don a boiler suit myself when dealing with matters mechanical: the attire somehow lends an infallibility to any words which may be uttered in relation to the conundrum in question. The shipwright heaved at the heads’ outlet pump and found it unsurprisingly immovable. I listened to him as if his words carried the verity of those of the village vicar. The broker and I looked at one another as if a prohpet had spoken and there was some hidden meaning to these words. But the truth was simply that it was very stiff. And would forever remain so. A few months before our refit of Gulliver G I spent £180 on a spare parts kit (essentially a bag of washers) and many a tender moment stripping and re-building this highly-feted wonder of British engineering. All to no avail. The two parts which would need to be replaced to stop seawater spraying out on each stroke of the pump would cost north of £1,000. The local chandlers were selling manual Jabsco toilets for £99. 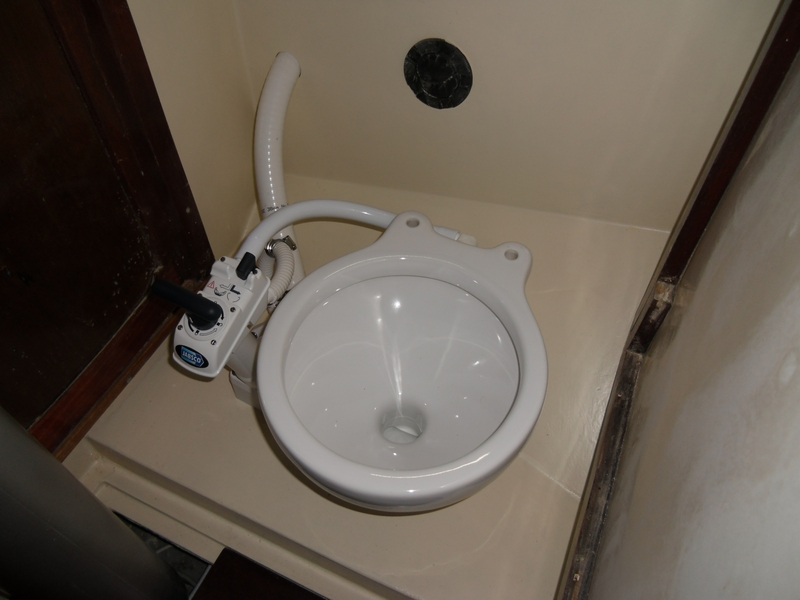 These toilets and parts for them are also stocked throughout the Caribbean. Indeed, the local chandler advised me that his 1950’s one-design wooden classic had boasted a Baby Blake which now languished in his loft. I gave in to the voice of reason. Out came the Baby Blake. 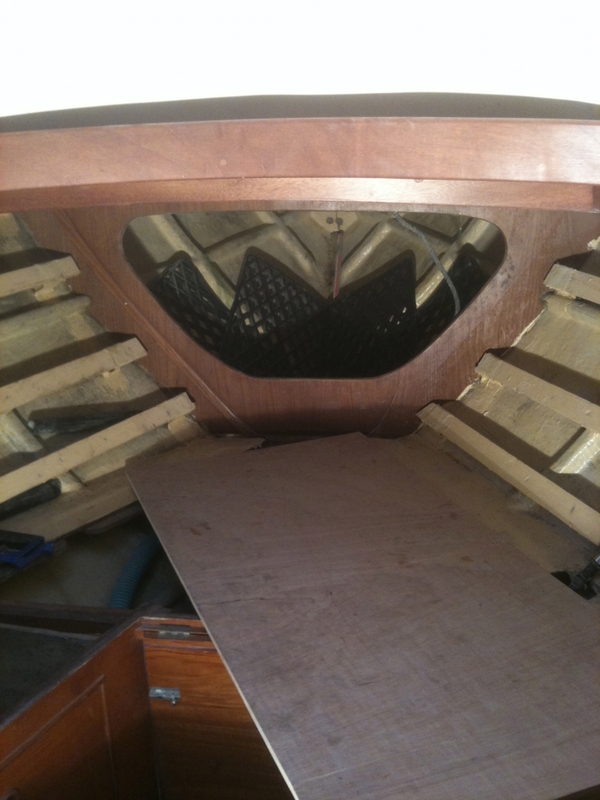 The doors in the heads compartment were made of ply with a teak surround. They had started to delaminate in places (presumably being made of interior ply), so those came out too. My friend Will, a furniture maker by trade, made up replica doors, complete with teak surrounds, for £140. This is the best value work I have ever had done on the boat. No doubt a shipwright would have quoted the better part of £1,000 for the same work. They like to quote in ‘000s, shipwrights. The doors were ready the weekend before we set sail to Cherbourg and I ended up fitting them over there. New door from heads to forepeak. 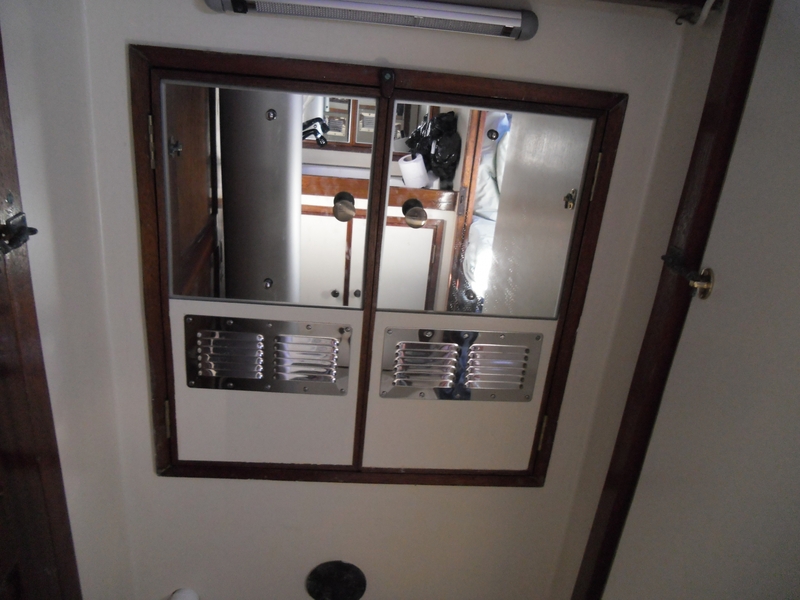 New port-side doors in the freshly painted heads compartment. Reflected in the left mirror is the keel-stepped mast. The LED strip light above the doors is another new addition. New starboard locker doors in the heads compartment. In front of them is the basin, equipped with a (new) manual Whale ‘Flipper’ pump and a shower head which runs off the pressurised hot and cold water system. I sanded the heads compartment and it’s lockers and repainted. They immediately looked a hundred times better and fresher. 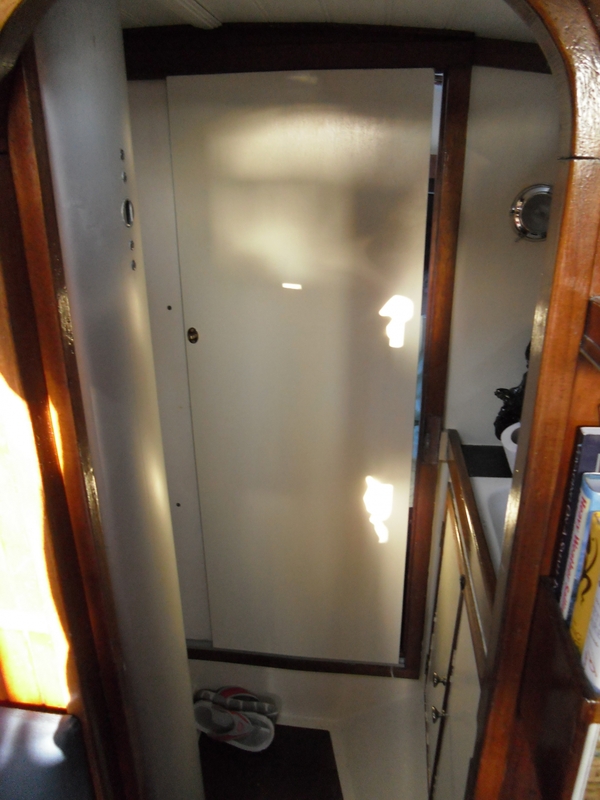 For all paint-work below decks I used single-pack marine paint. It does not cost much more than domestic paint, but is much harder wearing and I suspect that as soon as any seawater gets below decks domestic paint (by which I mean the paint that you might use in your kitchen or bathroom) would turn green and start to peel. Plumbing in the new heads, complete with new inlet and outlet hoses, was one of the last jobs we did before re-launch, but was relatively straightforward. I used a heat-gun to soften up the ends of the new hoses so as to get them onto the tails of the seacocks. The outlet hose said on it ‘No Alcohol.’ “Hmm,” I thought, “this could be a problem…”. New heads – seat and lid subsequently fitted! All seacocks throughout the boat are now of ball valve variety, apart from the outlet for the heads, which is a solid bronze Blakes conical valve, in prime condition. It is probably 30 or 40 years old, if not an original fitting. I would highly recommend having any gate valves (readily identifiable as being operated by round tap handles rather than levers) changed for ball valves before setting out. Our last gate valve, on a fitting well below the waterline, stopped working a few years ago and was promptly replaced with a ball valve. From the heads compartment we move back to the saloon. 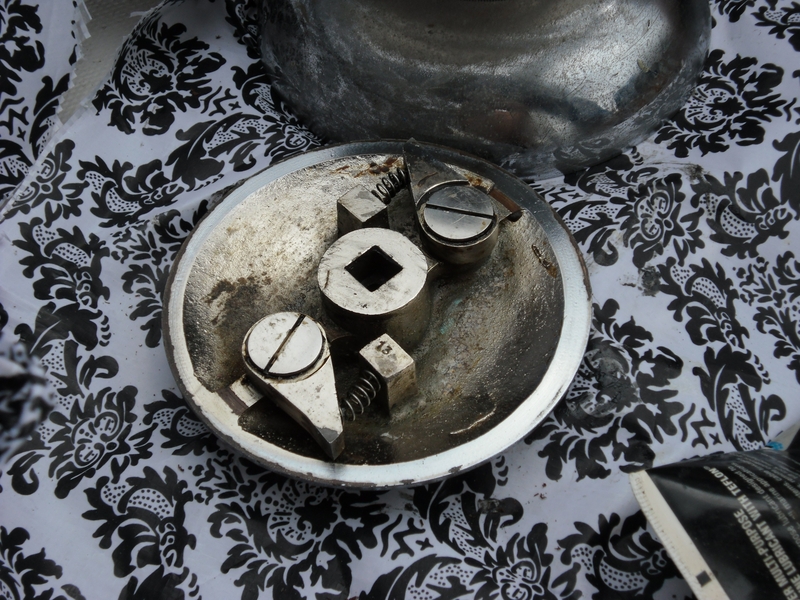 The Plastimo Neptune stove (gas, two hobs with a grill and oven) was taken home for a thorough clean-up. Everything that I have heard suggests that gas is much more readily available around the North Atlantic than kerosene or paraffin, so I would strongly recommend a gas stove. All modern gas stoves will run fine on both propane and butane, though different regulators are needed. As mentioned, all soft furnishings were removed late 2010 and the cushion covers and curtains went off to the dry cleaners whilst the foam infils for the cushions were allowed to air for a few months. Getting the cleaned covers back on the foam involved an evening of brute force, tight squeezing and bouncing around. Not quite as exciting as it may sound. In the saloon we sanded and repainted all of the lockers and replaced a number of hinges on the locker doors. The latter was not straightforward as the new hinges were not the same size as the old ones, so the doors had to be carefully aligned. Hanging doors could be an artisan occupation in itself. On passage across Biscay, in the perpetually rough weather, two of the locker doors kept flying open, spewing tins over the saloon floor. We found a new use for Jimmy Cornell’s World Cruising Routes: wedged in hard, the thick tome helped to keep one of the doors at least partially shut. The problem was easily fixed in A Coruna by re-drilling the holes for the pegs which were supposed to hold the doors closed. A nice, free and simple solution to something which had to be fixed (the sound of tins rolling back and forth across the saloon floor is maddening, they pose a health and safety hazard and they will start denting one another in no time at all). An incredibly expensive Weems & Plath barometer was fitted to the bulkhead which leads from the saloon through to the heads. We also added some additional teak book cases and other storage racks, all of which came up very nicely with a couple of coats of varnish. An EPIRB was fitted next to the companionway. The final significant improvement to the saloon was to run the thick cable from our Aero6gen wind generator under the starboard bunk rather than having it snake across the saloon floor. I will come back to the question of power shortly. The only reason I mention the cable at all is to make the point that the below-decks work was very much focussed on ensuring that everything was tidy and ship-shape, and would remain that way however much we got thrown around. Finally, aft of the saloon below decks, we come to the cockpit lockers. These too we emptied of all kinds of gunk, including leaking oil cans and slimy bits of canvas which we inherited with the boat and had held onto ‘just in case’. Many areas of the cockpit lockers on a Nicholson 32 are very hard or near impossible for your average adult to reach, simply because there is not enough space in which to manoeuver one’s torso and limbs. Having experienced the panic of my upper body being momentarily trapped in the starboard locker when routing some cable a year previously, I was not about to repeat the mistake of sliding too far in, so I sanded and freshly painted all those areas within reasonable reach, all the while thinking that small children must have been sent in to paint the less accessible areas when Gulliver G was built. Freshly painted aft deck and cockpit. Note also the aft locker: fresh and clean. And a tight squeeze! As a matter of interest for anoraks, the red keel behind the green car belongs to another Nicholson 32, Araminta of Hythe, who a few years earlier had completed the Azores and Back (‘AZAB’) race. Gulliver G’s decks and coachroof had last been painted some years before we took ownership and were starting to look rather tired, with much of the paint flaking off. Sanding and re-painting the decks took four days and much careful masking. “What’s that?” I asked, removing my dust mask, wondering why he couldn’t stand somewhere less conducive to lung disease. “Well, it’s fibreglass dust...” he lifted his hands and shrugged. “Don’t worry, it’s just old paint,” I advised. The old man harrumphed and hobbled off. Thank God he wasn’t around when I was grinding out the old anchor well, I thought. Unfortunately, some jobs are messy which is why boatyards are dusty and dirty. When we returned to the boat a week after completing the exterior paint job, we found that it already sported a discernable layer of boatyard grime. 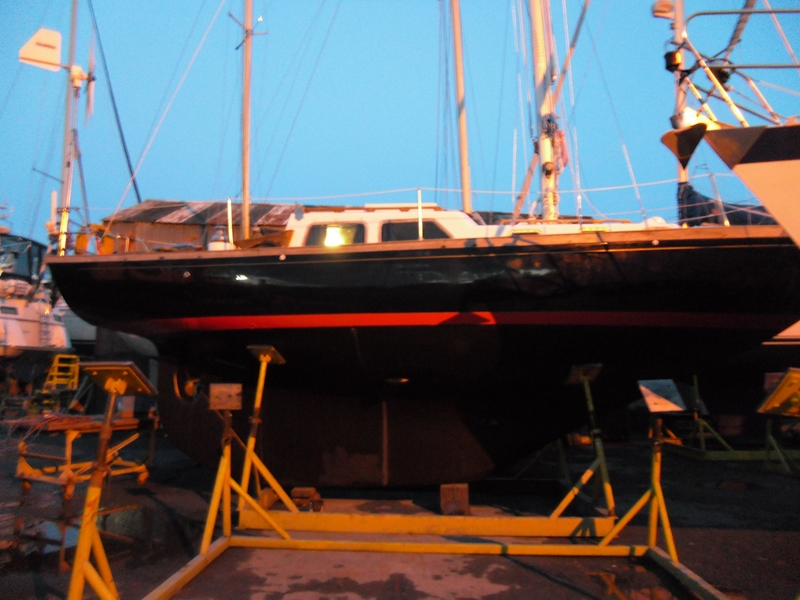 Gulliver G sporting fresh anti-fouling and boot-stripe in the last rays of a winter’s day, Gosport Boatyard. Kate re-sealed one of the saloon windows, which had been the source of a regular drip for a while. Keeping everything dry down below, particularly keeping sea water out, is really important. We packed all of our clothes in water-tight kit bags to be on the safe side, but those will not protect bedding and soft furnishings. 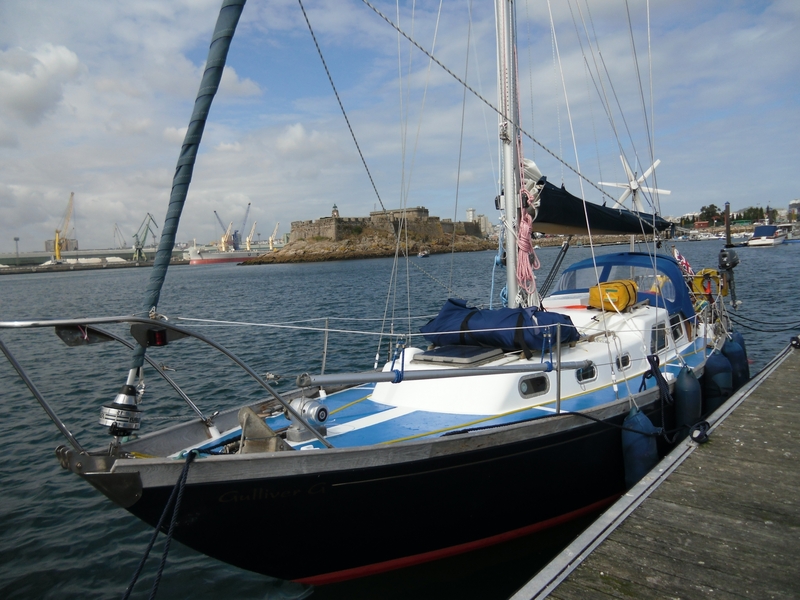 A few weeks later we were in Cherbourg following the Nicholson 32 meet and it rained. In fact, it hammered it down. All day. And most of the night. 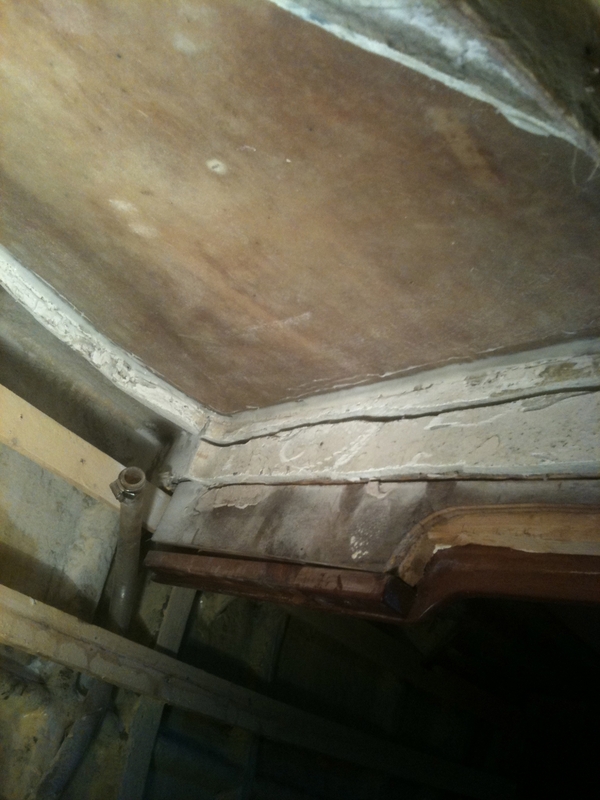 The window which we had re-sealed held up well – but now all of the others leaked! So much water was dripping in that we had to put out pots, pans and Tupperware to collect it. Fortunately that night we were invited to a friend’s boat for dinner. The next day, we bought plenty of Sikaflex and went about sealing the windows. The result was not particularly pretty, but has proved waterproof even with copious green water over the coachroof. How the seals on all of the windows could suddenly have gone is a mystery to me, but we counted our lucky stars that we found out in Cherbourg rather than out at sea in thick weather. The only other above-decks job not mentioned below was giving the winches their annual service. We will probably service them more regularly on this voyage, however, as they will be working somewhat harder than most years. The main jib sheet winches mounted on either side of the cockpit are Gibb 9CRs and were definitely on the boat when Clare Francis owned her, so they are at least 38 years old, but may be quite a bit more than that. 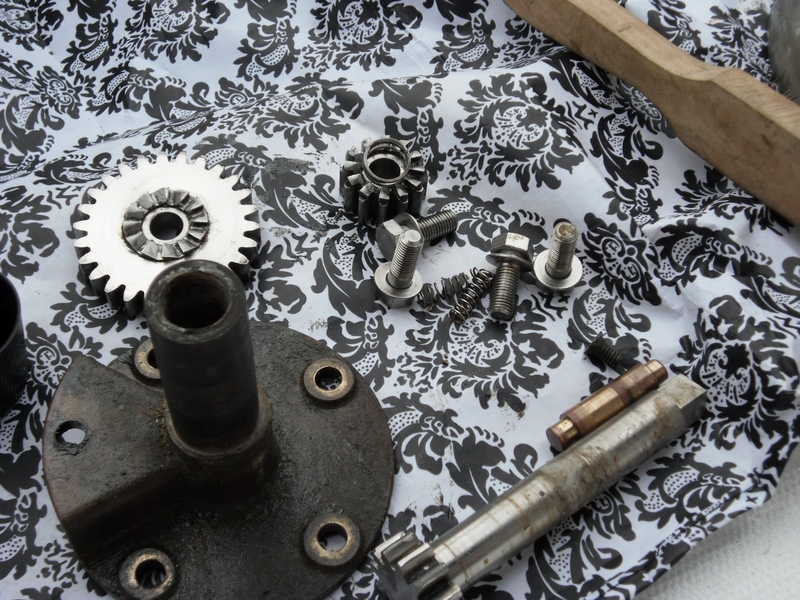 It always amazes me to find, when we open them up, that inside they look as good as new, the teeth on the cogs sharp as ever. Maybe things really were made to a better standard in the olden days. Kate concentrates on the job at hand. 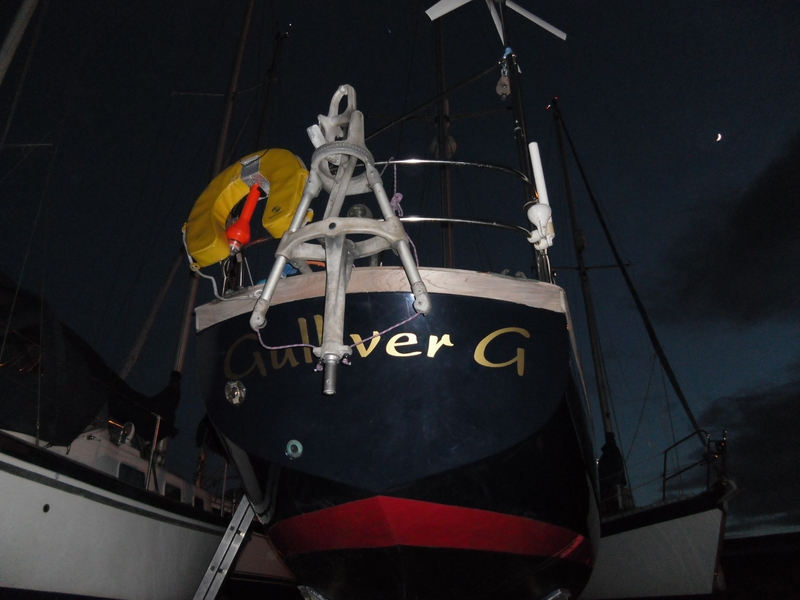 Gulliver G has a bermudan rig with Furlex roller reefing for the jib. The mast is a newish-looking Selden. The boom is an old Proctor which does not match the mast at all, being the golden colour of 60’s and 70’s anodised spars, but is engineered as if it were intended to be mounted on a Sherman tank. The one job which we wanted to carry out concerning the rig was the addition of a detachable inner forestay. The main reason for wanting this new stay was to carry our old hank-on storm jib, which is the age of Gulliver G, but in pristine condition and strong as an ox, save for the old bronze hanks we’d had replaced a couple of years earlier. We had never deployed the storm job in anger, yet it concerned me that in gale or storm force conditions the handkerchief of main jib which one dared unroll would be way too high above deck for comfort. Also, furling systems are not infallible, so it seemed sensible to be able to carry and hoist a No 1 hank-on genoa. Gulliver G’s mast had been unstepped when she was hauled out for the general refit and laid atop Gosport Boatyard’s mast storage shack, where it proceeded to accumulate a thick layer of grime. The proprietor of X W Rigging came and met me at the boatyard in March 2010 and we climbed up onto the roof of the shed to see what needed to be done. “You’re not used to heights, are you?” he said. “Er,” I said, stiff-legged and ready to grab onto, fixed or otherwise, anything in the event of a tumble as the rigger marched along the duck boards. “Oi,” yelled Chris Haddock, owner and Managing Director of Gosport Boatyard, “health and safety – where are your hard hats? I wondered how hard hats would help in the event of a fall whilst simultaneously considering that I had never seen anyone wear a hard-hat or any other form of safety equipment within the vicinity of the boatyard (staff in the commercial marinas seem to be required to don a life jacket before getting within 10’ of the water, though the old timers never bother to clip them up properly). Swallowing hard, I tried to blot out the fact that we were over six feet above ground and followed Paul to the base of the mast. “How old’s the standing rigging?” he asked. “Probably around ten years old,” I said. I knew what was coming, for I’d read in a number of places that standing rigging, which is the wires that hold up the mast, should be replaced every ten to fifteen years. I did not take much convincing as, sturdy though it seemed, the vintage and fitness of the standing rigging had been weighing on my mind. A dismasting mid-ocean is perhaps one of the worst fates which could befall a sailing vessel. By the time Paul and I had finished going over the mast and rigging the agreed jobs were: add a detachable wire inner forestay; replace all standing rigging like-for-like; add a new hole in the mast for an additional halyard (we had a spare block at the top of the mast and it seemed daft not to use it for an additional spare halyard); add two spinlock clutches on either side of the mast above the winches (these are a Godsend as they keep the winches free once halyards have been tightened) replace all running rigging (the topping-lift and the various halyards) with cruising dyneema, all 12mm apart from the topping lift which is 10mm. I should clarify that Gulliver G is different to many yachts in that the halyards do not run back to the cockpit but need to be handled at the mast. Dyneema is a seriously strong and expensive rope, so it is reassuring to know that our halyards are made of it, but we carry all of the old halyards as spares. The cost of the works to rigging ran to about £4.5k – after I had wrangled a respectable discount – but so long as one can afford new standing and running rigging, I would not recommend going without. If renewal is outside the budget, I would at least suggest getting a rigger to take a look at what you have and to identify and rectify anything which may be likely to prove an Achilles heel. Many may consider Dyneema a luxury, but even new halyards of traditional braid would be far preferable than relying on those that have got you around your local cruising grounds for the last few years to get your craft across the Atlantic. Gulliver G had a fairly new Jeckells roller-reefing jib, an identical jib which had been ripped in a Round the Island Race misdemeanour a few years previously (caused by a fellow competitor who managed to sail straight under our bows despite being the give-way vessel) and a rather baggy fully-battened main, as well as seemingly unused storm jib and trysail. We had the torn roller-reefing jib repaired as a spare. North Sails made us a beautiful new fully-battened mainsail designed for ocean cruising, allowing us to carry the old main and battens as a spare. Battens are hard to stow, being rather long, so we lashed them to the deck, held down by the liferaft and tender. North Sails had recommended stowing them inside the boom, but on our ‘maiden’ (post refit) voyage to Cherbourg we found that they worked their way out and, in any case, were concerned that they may become entangled with the reefing lines. We also carry the boat’s original (1967) storm jib and trysail, a much more recent cruising chute with a sausage-style stowing system and a hank-on No 1 genoa for the detachable inner forestay. The new main alone was about £1,200, but well worth the investment. 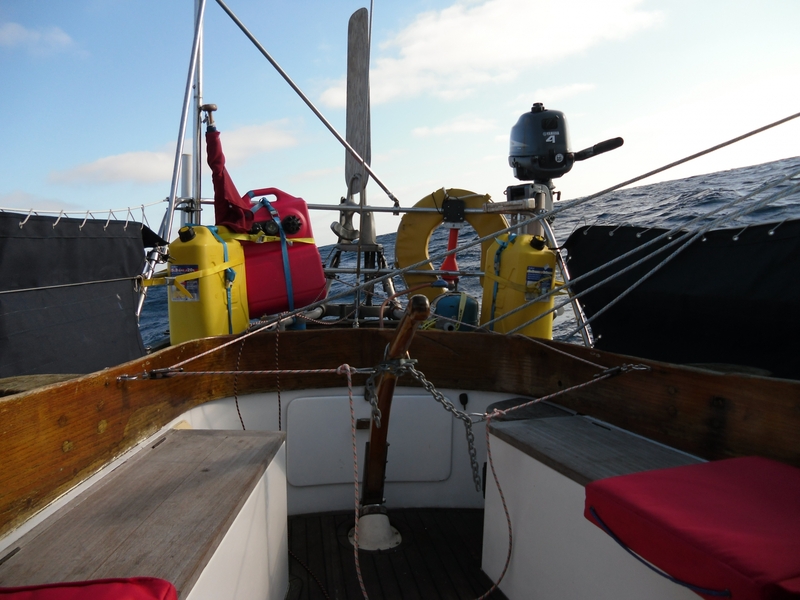 We replaced the jib-sheets, carrying the old ones as spares, and also replaced the three reefing lines for the main with new Dyneema lines, again stowing the old as spares. An old hank-on jib for flying on the detachable inner-forestay only cost about £175 from Sea Teach, from whom we also obtained a lightweight telescopic pole for poling out either jib or cruising chute. An essential element of any block and tackle system is… well, the blocks. Over the years Gulliver G had accumulated an horrendous array of plastic blocks. During the refit I was delighted to find that our local chandler, YouBoat, stocked a good range of Gibb blocks, which have been out of production for a long, long time, but which suit a boat of Gulliver G’s vintage down to the bulwarks. They are also immensely strong, being as over-engineered as our Gibb winches and made of a seemingly indestructible material called ‘Tufnell’. I really don’t understand why they are no longer made. We blew about £400 on new Gibb blocks from the old stock, carrying the previous blocks as spares (we also have a lot of spare shackles; along with the blocks, lines and sail needles and thread these make up the hard-core of our rigging spares). Gulliver G has a tiller, which I most definitely favour over a wheel on a 32-footer. You know where you are with a tiller and since it is directly connected to the rudder stock, there is a lot less to go wrong than is the case with a wheel and it’s wires. Tillers lend themselves to wind-vane steering gear, so it is perhaps no surprise that many Nicholson 32s sport Aries or similar on their sterns. When Clare Francis sailed Gulliver G across the Atlantic she had a Gunning fitted. An old boy in Dover Harbour, who recognised our boat from years gone by, explained that Gunnings were complex affairs made by some ex-Naval chap by the name of, unsurprisingly, Gunning, but when we acquired the boat she bore no signs of this gear. I researched wind-vane steering quite a lot on the internet but could find no mention of the Gunning, so decided to see if I could find a decent second-hand Aries. They are still made by a chap in Denmark, at a price of around £3,500, but the original Aries were so over-engineered that most of those built in Cowes on the Isle of Wight in the 1960’s are still going strong. They remind me a bit of the story of the 1950’s electric milk-float manufacturer whose build quality put the company out of business: the milk floats were so tough that they never needed to be replaced and continue to ply their trade to this very day. We found an Aries with a ‘Buy It Now’ price of £1,000. The description proved very promising and once I make my mind up about something I go for it there and then, so I bought it. This proved a good decision. The Aries was way down south – and west – in Dartmouth. I have always considered EBay to be rife with rogues, not least due to the explanations people give for flogging whatever it is: the UK seems to be awash with expensive electronics and valuable antiques which have been given as ‘unwanted presents’. What do you do when someone gives you that 17” MacBook Pro that you never really wanted? EBay it! A couple of phone calls with the seller, Marcus, restored my confidence in human nature. When he found out how far away we lived, he advised that his girlfriend’s boat was for sale on the river and that we would be welcome to stay aboard. I said that it was no problem, we would find a hotel for the night. Marcus sounded dubious. Within a few minutes of that call I had spoken to all of the hotels in the area. None would take a booking for just one night at the weekend, and all cost a fortune. I called Marcus back, rather sheepishly, and was most glad that I did. Not only did we have a boat to ourselves in the middle of the River Dart, but Marcus lent us his work boat to get around and in the evening we joined Marcus and his girlfriend, Freya, for dinner at the local pub. They had both recently completed trans-Atlantic voyages – the Aries had steered Marcus the whole way in the 1870s – style timber Cornish fishing smack which he had hand-built using only traditional methods. We got ourselves both an excellent and recently re-built Aries and loads of advice on how to use and maintain it and go about the voyage in general. The key trick with Aries is to give them a daily dose of 3-in-1 oil to keep everything well lubricated. “Just throw the stuff on,” Marcus advised. In addition to the Aries we have a Raymarine GPX Tillerpilot. This formidable bit of kit, which also cost about £1,000, can handle virtually any conditions, but uses a fair bit of battery power. We tend to use the Tillerpilot when motoring or in very light winds. I have heard many others advise on both systems. If I could only afford one, I would go for the wind vane over and above anything which uses electrical power. Some people complete long ocean passages with electric autopilots alone, but batteries can fail, motors burn out and microchips malfunction, so this seems like a high-risk strategy to me, to say nothing of the huge power demand. Aries attached! Maybe not quite dead centre, but it works beautifully once everything is balanced and tuned. Aries at work, on passage to Madeira, 12th October 2011. Aside from the electric autopilot, when in use, the key drains on our batteries are the Waeco chest fridge, which we keep lashed in place on the saloon floor, and the GPS chartplotter and radar. Our cabin lights are all either halogen or LED, so use little power. The mast-head tricolour, by contrast, seems to use loads and I would love to replace it with an LED tricolour at some point. The only reason I did not do so during the re-fit was because they cost the better part of £500. To minimise power consumption, we only use radar when really necessary and on passage keep the GPS chartplotter and other instruments switched off. We switch on a handheld Garmin Etrex GPS receiver every few hours to get fixes which are noted in the log book and every few hours plotted onto the paper chart. The intervals between plotting our position on the chart vary depending on the scale of the chart. They also become much more frequent as our destination draws closer! The fridge is the one electrical ‘luxury’ which we keep going: so nice to be able to have fresh dairy products and cold drinks on passage. Most new boats which I have been on come fitted with an upright fridge like one might have at home. This is not a good idea as the cold air will fall out as soon as the door is opened – along, I suppose, with everything else. A chest fridge is a much better option. We have always had two deep-cycle batteries. One domestic and one saved for cranking the engine. These were replaced with two AGM Rolls batteries of 120 amps each. AGMs are more expensive than conventional lead acid batteries, but they will hold their charge for longer, charge more quickly and can be discharged down to 20% without the risk of any damage to the battery. In conventional batteries the lead plates will buckle if discharged to around 40%, which greatly reduces the life of the battery. Furthermore, AGMs should last a good ten years or so and any decrease in performance will be gradual, whereas conventional lead acid batteries can fail immediately and without any warning. The plan had been to use both 120 amp batteries as the domestics and to wire in a third AGM battery, of only about 50 amps, but capable of discharging very high currents, as the cranking battery. At the time of writing (11th November 2011) we have just acquired a 90 amp deep cycle lead acid battery after trouble starting the engine due to flat batteries, so we will use that as the cranking battery and add the 50 amp to the house bank. The more battery capacity the better. Gulliver G is equipped with a massive Aero6gen wind generator, capable of cranking out 670 amps per week if the average wind speed hitting the blades is 12 knots. The efficiency of the windgen is expected to greatly reduce when sailing downwind due to a reduction in the force of the wind reaching the blades because of the forward motion of the boat (as should be the case on the trade wind routes). The plan was always to add a couple of large solar panels in the Canary Islands, where I imagined things to be much cheaper (which they are). We got lucky and were able to buy two second-hand 75-watt panels from another yacht for €250, regulator included. On a sunny day these should put out somewhere in the region of 50-70 amps. Gulliver G’s engine is a 28 hp diesel Yanmar 3GM which was installed about three years before we bought the boat – so about eight or nine years ago. If the reports are to be believed, Yanmars are amongst the best yacht engines as they are very well engineered and designed specifically for yachts, rather than being marinised versions of engines made for land-based vehicles. That said, we know of a number of Nicholson 32s whose original Betas or Watermotas are still ticking along fine. We had to motor a good part of the passage to Madeira and found that at around 1350 rpm the fuel consumption is under a litre an hour. As our tank only holds about 75 litres and we carry 40 litres in jerry cans, this is good news. Averaging 4 knots in calms at those revs, it gives a range of about 500 nautical miles. Our tank is miniscule compared to most other cruisers, many carrying 600 to 1,200 litres of fuel. Then again, Gulliver G is a lot smaller than most other boats going around the Atlantic. A lot of money was spent on the engine before we set off. Firstly, the fuel tank had to come out, receive some welding and get pressure tested. It transpired that a faint aroma of diesel down below was just that: diesel. A pinprick in one of the welded seams at the base of the tank was to blame, and explained why our bilge water was always red. Getting the problem fixed was brilliant as Gulliver G now smells completely sweet below decks. It also cost around £700. Once the boat had been re-launched, in May 2011, Gosport Boatyard carried out a full service. They advised me that the engine mounts were all rotted through and should be replaced. Needless to say, they could only be replaced with excruciatingly expensive Yanmar mounts. I was concerned about the potential for seawater to get into the engine on passage (it being below the water line), so had a new exhaust pipe fitted with a larger goose-neck and the anti-syphon valve moved to a higher location whilst all the other work was going on. The bill came to around £2,500 (excluding the work to the fuel tank). All seemed to go well with the engine until we were about 17 miles out of A Coruna early one morning. Having spent three and a half days crossing Biscay in rough and rolly conditions, we knew that a gale was imminent (all the classic signs: falling barometer, a beautiful evening with mackerel skies and mares tails, which make tall ships carry small sails). I was therefore keen to wake Kate with the sound of the engine and motor in as fast as possible. I switched to both batteries and pushed the button. A ‘clank’ but nothing else. My immediate thought was that the engine was seized. I pictured the cylinders brimming with water. I will go into more detail in my account of Leg 1 of the voyage, but suffice to say nothing I tried – changing batteries, lifting two of the three decompression levers on the cylinders, bleeding the engine – would work. The thing was seized solid as an old iron sluice. When the local boatyard, Marina Seca, came to repair the engine a couple of weeks after we had returned to the UK, they advised that the problem was indeed water in the engine and that people generally found it easier to replace the engine than to repair it. Once I had recovered the power of speech, I advised that we were taking some time out from work to sail across the Atlantic and that there was no way we could afford to replace the engine. The boatyard promised to do the best they could as cheaply as possible. To my huge relief, Marina Seca managed to fix the engine. 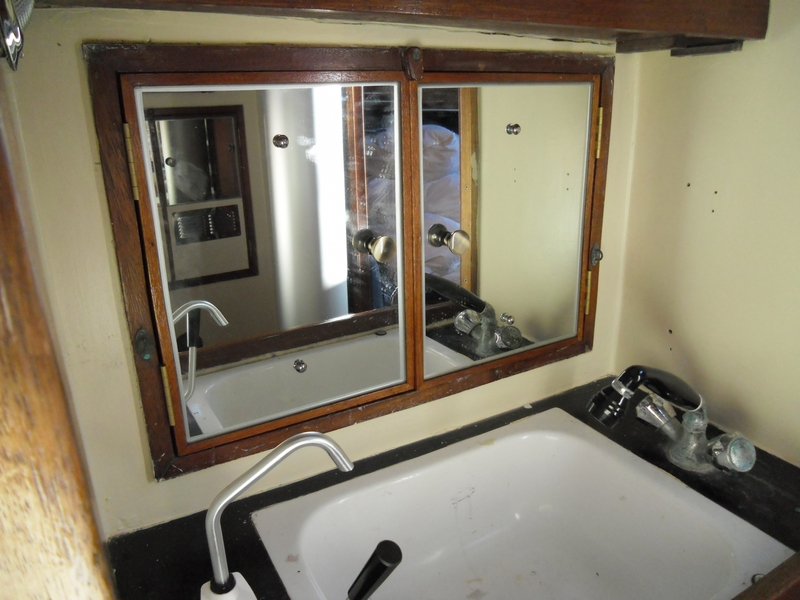 This cost a little under £1,000, which included a new heavy-duty bilge pump as the old one had given up the ghost. Note added 6th February 2012: after ongoing problems with the engine (mainly difficulty strating), it now appears to have died completely. We had to sail into St David’s Bay, Grenada, where a test revealed low compression in all cylinders as well as more sea water in places it shouldn’t be! See ‘Repowering Gulliver G’. This may be described fairly briefly, because preparing ourselves for the voyage really only involved filling in some gaps in formal training. It has always seemed to me that people who do not own their own boats tend to hold far more sailing qualifications than those who do. Why is this? Well, imagine you do not need a license to drive a car. Upon obtaining a car the more conscientious may undertake some basic instruction but it probably wouldn’t take most people long to grasp the basics and so long as one were generally able to drive oneself around without mishap, it is hard to see why many people would choose to pursue a formal qualification unless there were some other compelling reason, such as insurance. Those who do not have their own cars, I would surmise, may be more likely to proceed with a full suite of lessons, right through to getting a license, as the lessons themselves provide an opportunity to drive and the license demonstrates, in the absence of one’s own car, that one is able to drive. Useful for hiring a car or borrowing some else’s. To apply the same logic to boats: in the UK no formal qualifications at all are required to skipper a small sailing boat. 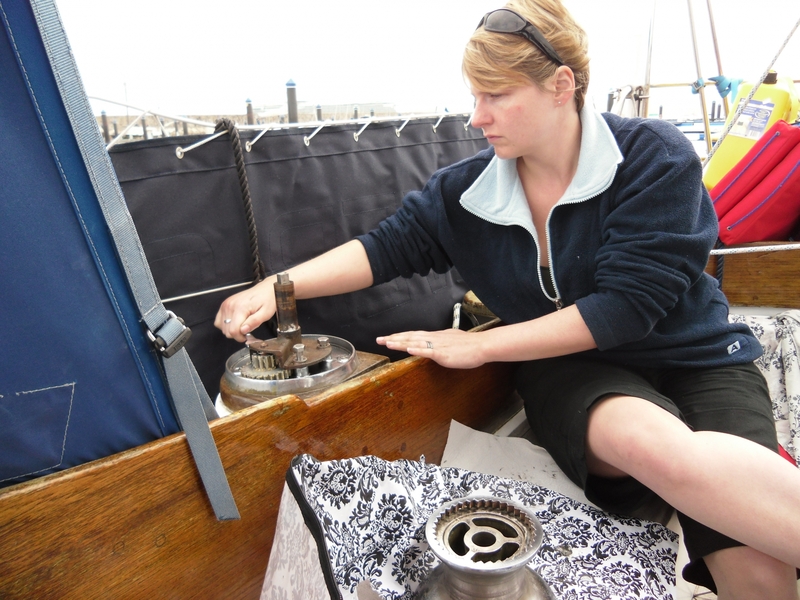 Most boatowners are, however, likely to have undertaken a basic qualification, such as RYA Dayskipper, for their own peace of mind and that of their insurers. Royal Yachting Association qualifications are recognised as industry-standard throughout the UK and much of the world. 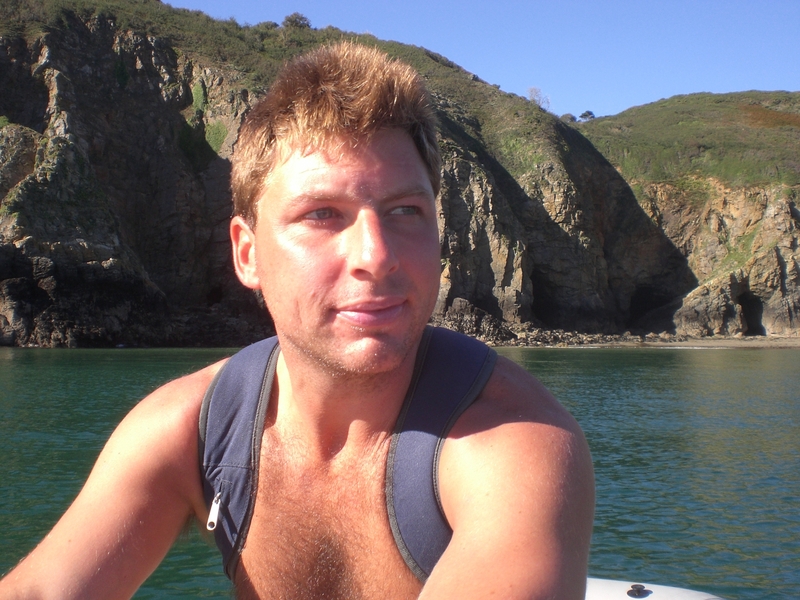 Dayskipper will teach the essentials, like rules of the road, what the various types of buoy and their lights mean, how to read a chart and figure out one’s position on it, what direction to steer the boat in to get to where one wants to go, and tidal heights and streams. For a great many boat owners there is simply no imperative to progress the formal qualifications beyond a certain basic point. The opposite is true for non-boatowners. Working their way up through the RYA syllabus (which goes something like Dinghies, Competent Crew, Dayskipper, Coastal Skipper, Yachtmaster Offshore, Yachtmaster Ocean) is often the best opportunity that they will have in the initial years to go sailing, probably in sailing school boats. Once they have the higher qualifications, this simplifies yacht charter and is also likely to open up opportunities to crew for those who do have their own boats (and who, despite their own lack of formal qualifications, are likely to be interested in the level attained by new crew). And so it was that having obtained the Dayskipper qualification shortly after we bought Gulliver G and despite best intentions to the contrary, I had never completed any more of the RYA syllabus and Kate had not done any of it. Not wishing to take risks through gaps in knowledge, and thinking that we would require further qualifications in order to get insurance for the voyage, we decided to pursue further qualifications over Winter 2010/11. I did Yachtmaster Coastal/Offshore theory by way of evening classes in London, immediately followed by the Yachtmaster Offshore practical during a frigid week of thick snow and frozen ropes in November. 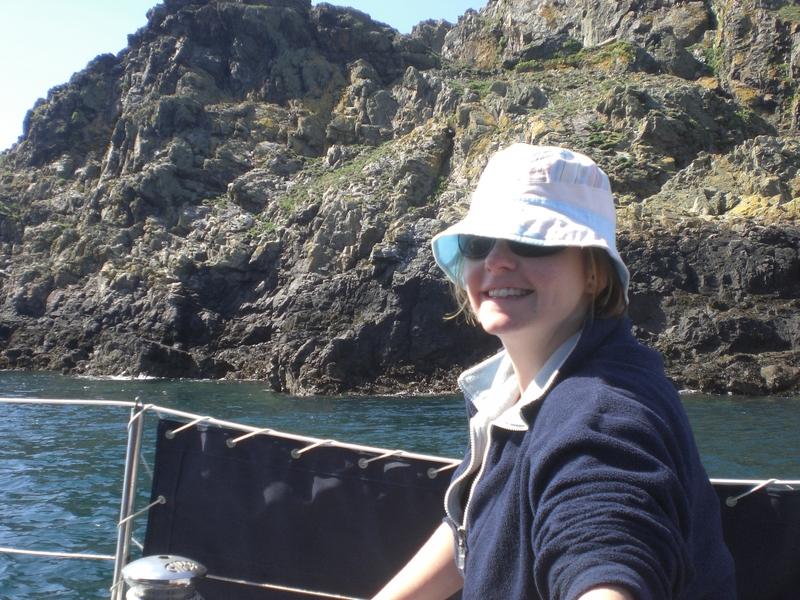 Although Kate had not done Dayskipper, I felt that Yachtmaster Offshore theory was well within her grasp and she did that over three weekends at the Cruising Association in London, whilst I worked on the boat. As expected, Kate aced the Yachtmaster Offshore. The final step was for us both to do the Yachtmaster Ocean theory course, again at the Cruising Association in London. As with the other courses, a great aspect of these classes was the other people on the course. 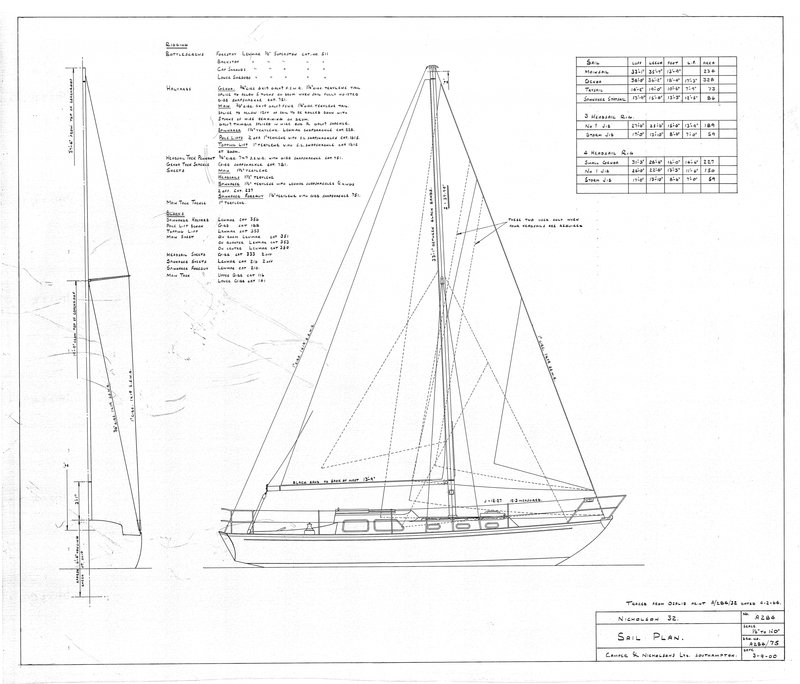 Unlike the preceding courses, though, we found that almost everyone on the Yachtmaster Ocean had their own boats with plans of long-distance cruising. The bulk of the course is taken with celestial navigation, which involves lots of number-crunching, leafing through tables of figures in minute font and some trigonometry. At times I found it hard to see the wood for the trees, but Kate is much more a numbers-person than I and was soon firmly established as teacher’s pet, regularly assisting in the instruction of the rest of the class. For me, the most nerve-wracking of the courses was the Yachtmaster Offshore practical, where one’s boat-handling skills really come under the microscope. Because Gulliver G was laid-up ashore when I wanted to get the ticket, November 2010, I choose to do the course with the sailing school with whom I had done the theory, First Class Sailing. For the four of us taking the course, it involved three days of preparation with a sailing instructor and two days of examination with a separate examiner. The boat was a 37 foot Jenneau, very different to Gulliver G being a light-weight fin keeler with a wheel. All went well for my examination until it came to picking up a mooring buoy under sail at night in an icy force five. Here the difference in performance between the Jenneau and a heavy long-keeler, low freeboard, vessel like Gulliver G came to the fore as I found that in the Jenneau I kept releasing the sails too early. As soon as they were de-powered the wind would take the bows and we would rapidly swing away from the buoy which had been so tantalisingly close. Gulliver G is the opposite: heading into the wind to pick up a buoy, one has to de-power relatively early, otherwise momentum will carry the boat straight past the buoy. The Yachtmaster Offshore practical was a week which I will always hold dear for the company of the three others on the course and the very colourful characters of our instructor and examiner. A favourite line from the latter, who had won his handicap in that year’s Round The Island Race in his Twister 28 (which he had sailed around Cape Horn a few years earlier) with his three sons as crew: “My sons think they’re better sailors than me. They’re not.”. Despite coming in for some due criticism on picking up a buoy under sail, I got my ticket. But, the Jenneau handles so very differently to a Nicholson 32 that were I to do it again I would instead get a day’s preparation from someone who knows boats like mine and then get an examiner to come aboard my own boat for the exam. Doing the exam on your own boat would carry two key advantages: (i) more opportunities to impress the examiner by showing off your boat handling skills and (ii) quite possibly learning one or two tips and tricks which will help you get more out of your boat. We had paid for the work on the boat as we went along. During Gulliver G’s refit the respectable salary I made as in-house counsel was re-distributed amongst Gosport’s chandleries quicker than it came into my account. Realising the scale of our spending, the chandlers very kindly discounted our bills. Even so, some careful juggling of credit card and overdraft facility was required on a few occasions to avoid getting completely maxed-out. One wet Saturday morning on her way into London for her Yachtmaster Offshore exam, Kate wrote off her BMW Z3. Fortunately Kate was unharmed and no-one else was involved. More importantly she still made it to the exam, her performance in which was impressively unaffected by the morning’s diversions. Every cloud has a silver lining; in this case it was the insurance pay-out, which covered the rigging work. I didn’t keep track of how much the refit cost, preferring not to think about it, but the damage was somewhere in the region of £15 - £20,000. Of course, it would have been quite easy to spend much more – more batteries, more gadgets, a watermaker, all that jazz, but fortunately for my bank account I simply did not have time to buy any more stuff! As soon as Gulliver G left Gosport in the early morning mist and light of 3rd June 2011, bound for A Coruna via Cherbourg, spending declined drastically. Somehow we managed to clear all debts (except for the mortgage, of course!) before setting off on our voyage. Before we set off some friends asked about budget – one knew of a couple who had budgeted £1,000 per month for a two year trip and spent the whole lot in the first year. Another friend mentioned a couple who had spent something like £1,500 per month. So, the main costs should be food and drink, punctuated by the odd fuel or laundry bill, the occasional marina stay, chandlery visit and, at some point no doubt a haul-out for scrubbing off and anti-fouling. On passage we will not be able to spend anything. Even if a rather generous £10 per day is allowed for food and drink (£5 per day is far more likely), monthly spending should not be more than £500. For a few years we had taken advantage of the low interest rate to overpay our mortgage. Whilst away we are paying the mortgage using the overpayment fund, which should be good for the better part of 20 months, freeing up the income which we make through letting the house to cover costs. The house required some work to get it up to scratch for letting. Fortunately this was not expensive as it mainly consisted of packing away whatever nick-nacks, curios and clothes we could not bear to chuck, building a summerhouse to put most of it in (the other half, including a few hundred weight of books, going into our ever faithful and increasingly less studious study). From having spent all of our ‘spare’ time on preparing Gulliver G, as soon as we returned from A Coruna focus turned to the house and we certainly needed the full three months before going back out to the boat to get it all done. I dread to think how much of 2011 I spent brandishing either a paint brush or a roller. By the time we finished clearing and cleaning and painting and panting the house looked far nicer than it ever had in all our years of living there! By the time all preparations were complete we were so exhausted that it is hardly surprising that we spent most of our first week back on Gulliver G doing pretty much nothing. I am slightly stunned when I think back to the frenetic activity which, over the course of a year, went into preparing for this adventure, whilst also balancing our demanding jobs and ensuring that we had some time free for friends and family. It was an absolutely non-stop onslaught of action and an interesting experience in itself. Everything just kind of happened. The value of immovable deadlines in the project of preparing for an Atlantic Circuit in Gulliver G showed it’s worth. Conversely, now that the adventure has begun we have no particular deadlines which may explain why at the time of writing (11th November 2011) we have been at anchor in Puerto de Naos, Isla de Lanzarote, Isla Canarias, for 9 days doing very little except writing, perhaps a little excessively (for which I hope the reader will forgive me), about the journey before the voyage. Gulliver G in A Coruna, 18th June 2011. We sailed her onto this pontoon after engine failure and a Biscay gale.